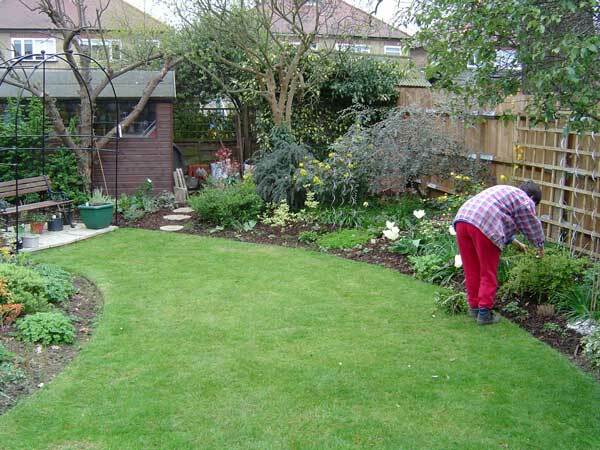 A job we started in 2004 was the reshaping of the main lawn and the introduction of a bower at the focal point in the far left corner. After seeing the price of propietary bowers, we toyed with the idea of making our own out of timber or tubing, but we eventually settled for an Agriframes Sussex Bower. 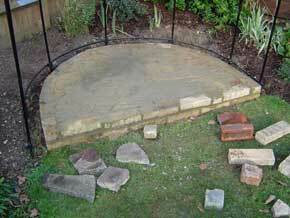 We had formed a temporary base and loose laid a pattern of slabs which reflected the shape of the bower. After several months use, we decided to form a permanent base, but an extra course of bricks higher to make more of a feature and create a wall against which, the surrounding earth could be sloped. The beds have recently been mulched with bark chippings which reduce weeds and moss and enhance the planting. 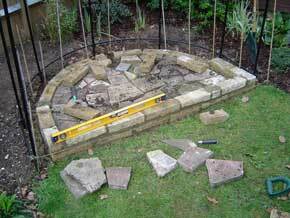 The soil under the base, which had been mixed with grit, was nice and firm, so the outer face of split stone blocks from the previous pond and barbeque were laid onto the ground. The central void was filled with old bricks and paving slabs. 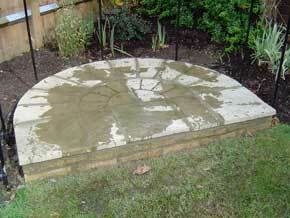 A hole and chamber was formed at the back of the base for frogs, toads, newts etc. We know they hibernate at this damp end of the garden as we often uncover them. Finally, the infill material was covered in residual sand & cement to form a flat base for the top slabs. Next day - The base with some residual water from the morning rain, but the slab pattern reflecting the bower itself, can be seen. 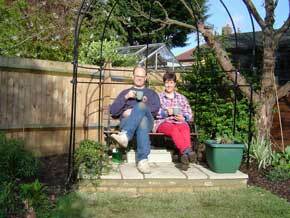 Then the sun came out at the end of the day and we had a cuppa to test it out. The next stage was to lift the bower frame, remake the post holes to align with the base, reinstall the frame and level it. We then spent a few weeks investigating types of mesh to infill the lower openings to a) provide a degree of enclosure but allowing views out and b) provide support for small climbers to be planted around it. We also had to select the main climbers. After much searching we gave up on black plastic trellis. 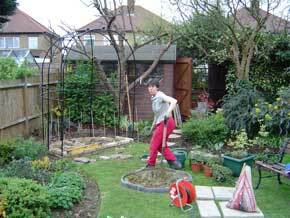 We dabbled in making our own trellis to match the feature fence panels. Jim cut down some roofing battens and we 'wove' them through the bower poles, but they didn't work very well. We looked at various natural screens, but finally settled on expanding willow trellis. Christine researched climbers and proposed Tracheospermum jasminoides. Over one weekend, we sourced the trellis and plants and assembled it all. 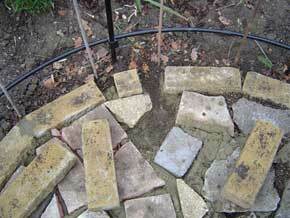 Christine also planted Sweet Peas and Lablab around the lower screen. 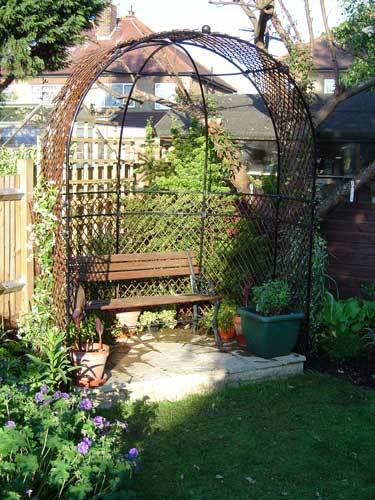 The trellis transformed the appearance of the bower and the Jasmine smelt wonderful.